The daughter of cinematographer Caleb Deschanel and actress Mary Jo Deschanel, Zooey Deschanel made her film debut as the conflicted, rebellious patient of a small-town psychologist in Lawrence Kasdan's Mumford (1999). 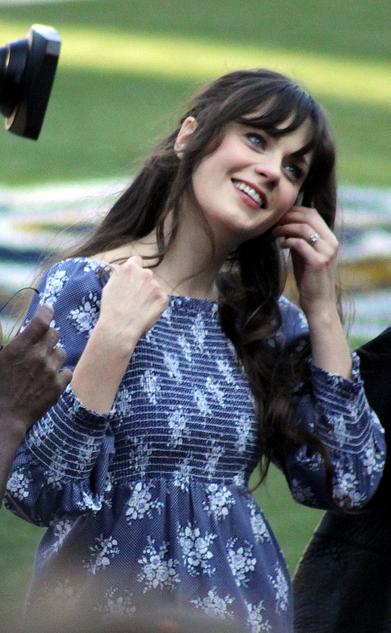 Prior to her debut, Deschanel -- who spent much of her childhood on location with her parents -- acted in a number of stage productions and made her professional debut on an episode of the sitcom Veronica's Closet. A year after making her film debut in Mumford, the young actress appeared in Cameron Crowe's Almost Famous as the sister of an aspiring rock journalist who becomes caught up in the parallel universe of '70s rock. After turning up in the Dogma 95-style Manic in 2001, Deschanel would join the strong cast of director Barry Sonnenfeld's long-delayed comedy Big Trouble before re-teaming with that film's D.J. Qualls for the loser-turned-smooth operator teen comedy The New Guy in (2002). After following up with a role in the equally ill-recieved teen-thriller Abandon the same year, Deschanel earned positive nods for her role as the virginal teen who falls for a reformed womanizer in critical darling David Gordon Green's All the Real Girls. Though her next few film roles remained relatively low-key, the latter half of 2003 found the emerging young actress appearing in both the independent black comedy Eulogy and wide-release Will Ferrel family comedy Elf.